BOTOX ® has been used since 1987…which means that its effects and side effects…and long term effects…are well known and documented. The use of BOTOX ® is still growing annually, with more than 2.8 million procedures currently being performed on a yearly basis. Studies over a 9 year period have shown no long-term negative effects through the repeated use of BOTOX ® among patients that received 30 injections over a nine year period. Quite the opposite! BOTOX ® restores the balance in the facial muscles and creates that “relaxed” look. By injecting the right amount of BOTOX ®, you can reduce the fine lines and wrinkles and achieve that “soft” look. Myth no. 3: BOTOX ® is poisonous! The effects of BOTOX ® are temporary, as the body naturally eliminates the administered BOTOX ® over a 3 to 6 month period of time. Clearly, as with any medication, excessive amounts should be avoided. Getting your BOTOX ® from an experienced medical professional is the key to minimizing this risk. Studies have shown the risk of this side effect to be less than 2%. 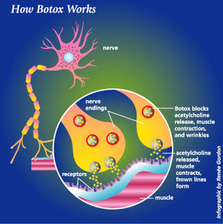 As the effect of BOTOX ® is temporary, this effect will wear off in a few weeks, should it occur. Here I tread carefully, as we all know that pain is a very personal experience! But to put this into perspective, your BOTOX ® treatment involves a few tiny injections that require no anesthesia. If this is your concern, talk to your clinician before the treatment. They can apply ice or a topical anesthetic, if this is required, although our experience has shown that this is rarely the case. These myths have been bugging the minds of people for so long! My friend also had thoughts on these before she went to a cosmetic surgeon before. However, she still encouraged herself to go on! She was happy with her decision, and she still pursues her botox procedures until now. I hope others out there shouldn't try to believe with these myths, because they'll never know until they have tried it.